On the evening of 6 November 2013, at the invitation of Raf Simons of Dior, a special Plastikman live show composed of entirely new material took place at the Guggenheim Museum, NYC. The album, ‘EX’, was released in June, and then days after its release, a second performance took place at the Sónar festival in Barcelona. Plastikman has now unveiled a live recording of ‘EXhale’ from the performance last month - the Sónar Live Mix – available as an MP3 / AIFF. 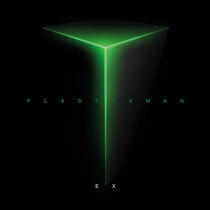 ‘EX’ is Plastikman’s first album release since 2003’s ‘Closer’, and is out now on vinyl, CD, digital and limited edition SubPac bundle. For the limited edition, he teamed up with SubPac to create a Limited Edition Premium Bundle: the album is presented on vinyl, with a signed certificate of authenticity and a custom Plastikman edition of the SubPac S1. Richie Hawtin is a DJ/producer, creator of the ENTER. experience, the man behind the M_NUS label, technological innovator and art aficionado – in 2011 he collaborated with British sculptor Anish Kapoor for an installation in Paris. Before this, though, and perhaps most famously of all, he was and is Plastikman, an electronic music producer with many followers and fans. Between 1993 and 2003, Plastikman created a body of work that expanded the dimensions of Detroit techno and arguably redefined the possibilities of electronic dance music. Across six albums (‘Sheet One’, ‘Musik’, ‘Recycled Plastik’, ‘Consumed’, ‘Artifakts (B.C. )’, and ‘Closer)’ and numerous singles such as ‘Spastik’, ‘Plastique’, and ‘Sickness’, he evolved into one of contemporary electronic music’s most distinctive voices: minimalist, psychedelic, seriously groove-laden, and ever mindful of the transcendent properties of electronica. ‘EX ‘ is out now on vinyl, CD, digital and limited edition SubPac bundle. Download 'Exhale' on the Soundcloud link below.